Chartwells believes serving healthy and nutritious food provides a foundation for lifelong learning. We are proud to feed future leaders and understand the immense responsibility we have to nourish our guests’ minds and bodies. We believe that wellness goes beyond our dining halls. To support a well-balanced healthy lifestyle, we create programs that help our guests live life to its fullest. From sourcing our ingredients to preparing our menus, we keep health and wellness at the forefront of everything we do. Read more about how we’re practicing sustainability on our campuses today. Items that meet the specific criteria of Compass Group’s sustainability initiatives, as a percent of total purchases for that category. As part of our commitment to health and wellness, we only purchase yogurt from cows not treated with rBGH. We offer only Humane Farm Animal Care (HFAC) certified cage-free shell eggs nationwide. In December 2007, Compass implemented a cage-free shell egg policy. All of our locations only offer shell eggs that are certified by the HFAC program in partnership with the Humane Society of America. In 2018, we committed to source Fair Trade products at all 280 Chartwells’ locations around the country. As part of this commitment, we offer Fair Trade Certified food and/or beverage items, such as coffee and tea, barkTHINS, energy bars, sugar and bananas in each dining operation. We have been providing Fair Trade coffee at many of our locations since 2016, and have purchased almost 1 million pounds of Fair Trade coffee since then. The nontherapeutic use of antibiotics in animal production is a growing public health concern because it decreases the effectiveness of antibiotics to treat diseases in humans. At Chartwells, we only serve chicken and turkey that have been raised with restricted use of these drugs, especially as a growth additive in feed. Our suppliers provide products that adhere to criteria developed in partnership with the Environmental Defense Fund. In 2016, Compass Group USA became the first foodservice company to commit to serving 100% healthier, slower growing chicken by 2024 through the landmark Global Animal Partnerships (GAP) agreement. We act to support campaigns that reward the efforts of farmers and laborers through our partnership with the Coalition of Immokalee Workers (CIW). Learn more and become a sustainer at ciw-online.org. Supporting the preservation of the American family farm, reducing the carbon footprint of our supply chain, and giving back to local communities are central to Compass’s core values. In support of our company-wide commitment to sustainability and wellness, Compass has been making strides to establish relationships with local farmers and produce distributors to encourage local buying and promote seasonally available produce. We will work with each campus to define what local means to them. We manage our waste streams in each of our dining facilities and offices to reduce waste to landfill as much as possible. Our teams recycle according to all locally available programs. Our food waste reduction strategies incorporate source reduction, food recovery and composting. Our Waste Not toolkit provides our teams with the necessary resources to track all waste in our facilities so we can implement strategies to reduce waste. Nearly 40% of all college students are struggling with food security. Food insecurity impacts students in all college and university settings, even those who have a meal plan can be food insecure. 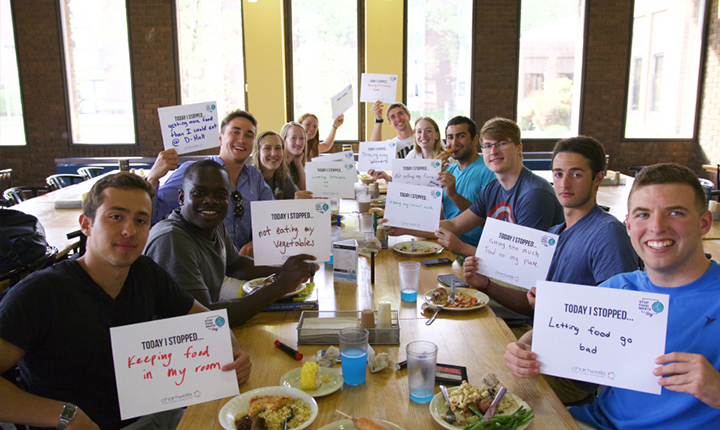 To counter this issue, Chartwells provides program support to address food insecurity in a variety of ways, including student food pantries, meal donations and partnerships with the Food Recovery Network or Feeding America. Chartwells is committed to protecting the threatened global fish supply. In collaboration with the Monterey Bay Aquarium Seafood Watch program, we established a landmark purchasing policy in 2006 that removes unsustainable wild and farmed seafood from our menus. Stop Food Waste Day is part of Compass Group’s commitment to reduce 25 percent of current food waste by 2020. While the company is well on its way to meeting that goal, during this year’s activities we encouraged students to take a pledge to stop wasting food. 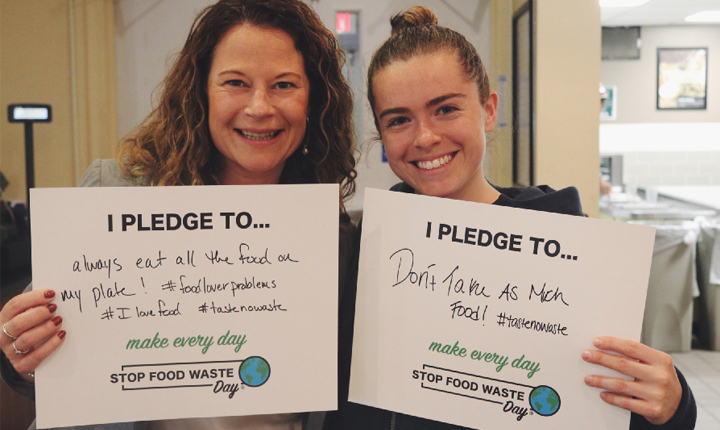 We also empowered our associates, clients and students to be “food-waste warriors” by spreading the word and educating others about this important mission.